We're very excited this week to host Thursday's Kitchen Cupboard for Robin, while she's away on vacation! We posted a picture of strawberry spinach salad a couple of weeks ago and got lots of feedback, so we decided to post the recipe. It's the perfect recipe for our garden this time of year because we're harvesting lots of spinach and just this morning we harvest our first strawberry! Those are very large strawberries! What variety is it? We wish we knew! We bought them from a farmer down the road. She didn't tell us what variety they were. They're June berries. They'll produce for about a month and then be done for the year. Last year they gave us 30 pounds. We'll see how this year goes. Yea, strawberries are a very big deal around here. You should have seen our five year old jump to attention this morning when his mom asked me to go out and see if there were any strawberries! Yum. I'm certainly harvesting both spinach and strawberries. Monday was the first harvest, but today was the first reasonably sized one. Hopefully they will get bigger as time goes on. I have three types. An early a mid season and an everbearer. Hopefully between them all I'll get enough to make some jam. We saw your strawberry picture earlier this week. It motivated us to get out and have a closer look at the patch. I'm sure yours will get bigger. You were smart to spread the production cycles out over the season. Yet one thing we appreciate about June berries is the way they introduce summer and then are gone, no more attention need be given them 'till fall. Yummy salad, our strawberries never made it to the table, I'm lucky to get a picture of them. I'm starting some alpine strawberry seeds hopefully the seedlings don't die and I'll get a tiny harvest next year. We feel the same way about asparagus we seeded this year. Looks great, thanks for the recipe. We have loads of lettuce right now and we picked our first strawberries this week. So we will have to give this one a try! Daphne in Massachusetts, Jody in Pennsylvania and Stoney Acres in Utah all harvested their first strawberry this week! It's a small world after all. lovely recipe thanks for sharing! That looks easy enough except no strawberries. Tonight I'm making your pumpkin black bean soup for the first time. You're going to love that soup. I recommend adding a spoonful of sour cream to each bowl when you serve. Mmmm. Thanks for posting this - I never had strawberries in a salad so I'm really loking forward to giving this one a go. You're going to love it! Enjoy. Hi Jody, my first post with Thursday's Kitchen Cupboard. Those strawberries look mouth watering and certainly a reminder to me to do some heavy work on my strawberry patch if i ever hope to grow strawberries like those. I also haven't tried or thought to put them in a salad so that's another for the recipe book. Thanks for sharing. Thanks for stopping by Andrea. I'm don't know how I missed you, but let me say in response, strawberries are definitely worth the extra work! I love the combination of spinach and strawberries. Although I love strawberries with pretty much anything! I've been fighting critters to harvest strawberries around here and it appears the critters are winning! That salad looks delicious! I may have to try it with the rest of my spinach! Thanks for hostessing!! It's my first post! Glad to host. If my wife were doing the posting, then it would be hostessing. Don't worry, your not the first person to mistake me for a girl. Spinach is so tasty with the addition of some fresh sweet - like strawberries! Thanks for the dressing recipe as I was looking for a good one for spinach and berry salads. It must be a Washington thing, 'cause not a lot of people have tried it. Enjoy the dressing! That first photo is too precious! And the salad looks absolutely yum. I wouldn't have thought to mix strawberries with spinach. I'll definitely have to try this one! Thanks Leigh. Q. James is definitely our berry kid! He's always on the scene when it's time to pick 'em. I tried to link in, but for some reason couldn't do it. Probably because I'm using my iPad. 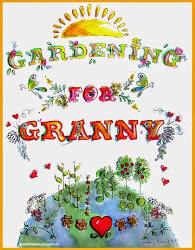 My blog is at http://greenlifeinsocal.com. 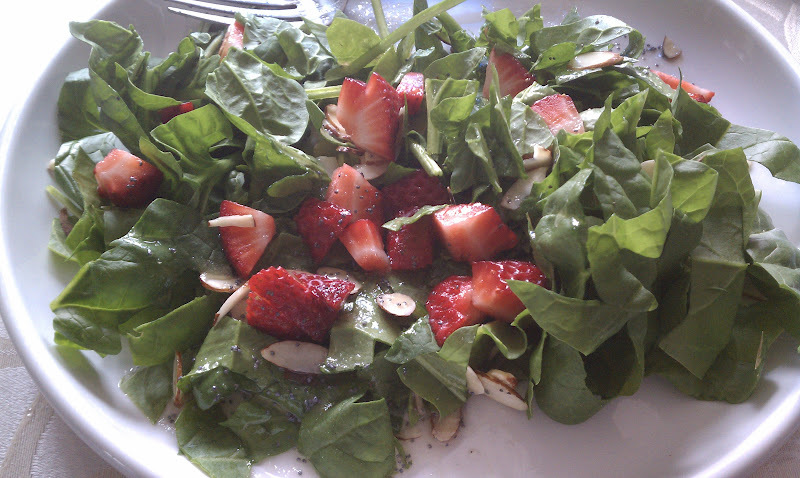 I love spinach salad with strawberries and almonds. I harvested my first strawberries this week from my strawberry jar, but they never made it to the kitchen. I ate them while watering. I can't imagine a harvest of 30 lbs of strawberries. Fabulous! Aren't garden fresh strawberries the best! Thanks for stopping by! I made your Black Bean and Pumpkin Soup on Thursday night. It was very good, a recipe keeper. My daughter helped me spice it up a little. We added one stick of cinnamon and a tsp of cumin. The pumpkin came from my daughter Emily's garden in NH (Greens and Jeans). She brought it at Thanksgiving, roasted it and pureed it for pumpkin pie except it was too much so the remainder was frozen for a later use. That turned out to be the soup! I had a bowl of it for lunch on Friday and it was even better with the flavors melding. Thank you again. We added a dollop of plain yogurt on top. Yum! We're so glad you enjoyed it! And thanks fo sharing your "spice it up" additions. We'll have to try them too. Nice! How is your broccoli coming along?? Ours is starting to head up. About a thumb size now on the bigger plants. Thanks. Our broccoli sounds very similar to yours in size. Some plants are definitely better than others. We're eager to see which variety does best in the final analysis. Salad greens are always nice with a bit of fruit in them. We do that over here as well. Be it strawberries or blueberries. Love your strawberry kid! That photo is priceless! The recipe sounds wonderful too! Thanks for hosting a very busy Thursday's Kitchen Cupboard!